Let others have their superhero costumes this Halloween, you'd prefer to pay your respect to a real historical heavyweight, Harriet Tubman! Tubman wasn't just a fierce abolitionist and suffragette, but she risked her life and safety to help hundreds of others escape to freedom (not to mention, she's the soon-to-be face of the $20 bill!). So, while your pals' costumes may come with capes, light up and make noise, or give them instant, undeniable 6-packs, your costume will imbue you with the actual might of a real-life superhero! Whether you choose to wear our Harriet Tubman Adult Costume for a theater performance, historical reenactment, or simply to capture your love of history this Halloween, we're certain you'll feel fantastic about your choice! Harriet Tubman was one amazing lady, but then again, so are you—take your respect to new levels by emulating your real-life role model. And leave the fancy flying and flashy antics to those others wannabe heroes! This ensemble is styled in line with the times—simple and sturdy. It's a black, long dress with a basic peplum, front buttons, and long sleeves. The neck scarf adds period-specific flair and lightens the stark appearance, and the head kerchief completes the look. Grab a lantern accessory to feel like a true beacon, or bring along your historical knowledge to share with other party guests. And don't be fooled—the look may be understated, but the effect of seeing Harriet Tubman walk into a party is totally unforgettable! 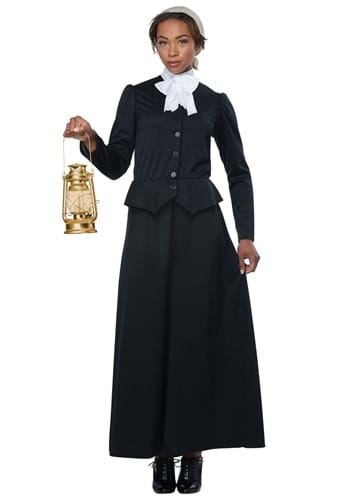 Wearing this costume comes with a bit of responsibility—you should be on your best behavior! Harriet Tubman was the foremost conductor of the Underground Railroad, after all. You owe it to her to keep up a high standard all night in this costume!